It’s time to cut the sashing and sew this top together! Some of you clever duckies out there have already done that and I’m ADORING the quilt tops that are finished. Please go check out the flickr group to see the tops and quilts that are finished. Can we say AWESOME?! Anyway, for the rest of us, it’s time to cut up some more fabric. There are two colors in my sashing as it looks in the image above. So I will give you the dimensions for cutting those. The sashing finishes at 3″ wide, so we will be cutting all our pieces 3 1/2″ wide to account for seam allowances. And now is a good time to square up those character blocks to 18 1/2″ unfinished. It’s going to be pretty common to have some variation in the block sizes. Maybe all of your blocks ended up at 19″. That’s totally fine. Basically you just need all of your blocks to be the same size. Adjust the measurements I am giving you to account for any differences but nothing is dependent on a certain block size now. To assemble the quilt top, we will be using a sashing with corner stones. I love to use corner stones when doing a sashing on a sampler quilt like this because it really helps keep the quilt squared up. You can skip the corner stones if you want and just do long strips of sashing if you prefer though. To create the sashing rows, sew (4) corner stones to (3) blue strips of fabric as shown. You will need to make (5) rows like this. 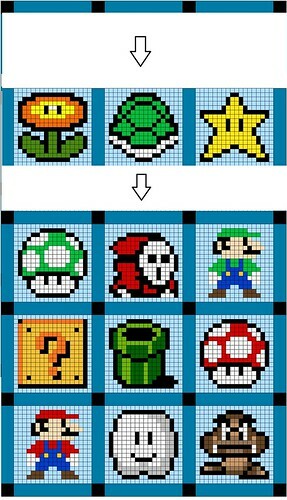 To create the character rows, sew (4) vertical blue strips to (3) character blocks as shown below. Use the layout shown in my overall quilt pattern or create one of your own. Assemble the full quilt top by sewing each sashing row to a character row, following my layout. Be sure to use pins to help you match up the corner stones with the vertical sashing strips. The quilt grows very quickly at this point, so pins help keep everything in place as the weight of the fabric starts to pull on the quilt. Your final quilt top “should” measure somewhere around 66″ x 87″. A perfect twin sized quilt! Select the batting of your choice…either a couple of yards of batting on a roll or a prepackaged twin or full size batting. Create the backing of your choice. There are some fabulously creative ones out there and I had high hopes of being one of those. But at this point, I just need to get the quilt finished. So I’ll be going the quick route…with one fabric. I’m going to use (4) yards of fabric cut into (2) yard lengths. Sew the lengths together to create a 72″ x 90″ish backing. Then bind…I estimate about 3/4 yard needed for a binding. I plan on going with a print for this. After all of those solids, I think a little print around the edge will be fun! I can’t wait to see even more finished quilts. Join me in my goal to get this finished by Christmas. Or start now and get a couple of pillows done! This is a proven design winner among particularly the boys or boys at heart in our lives. I haven't started mine yet, but I'm going to sew it together without doing it all in pixels, so I think I'll quilt it so that it makes the pixels for me. A whole lot of straight line quilting for one quilt, but it's the best I can think of to get the pixel look without actually cutting out those million squares. Hey Angela… I would be the only one to notice this… but thanks for the nod in your blog post title 🙂 Some people do think I am Super, but most REALLY think my brothers are 😉 …and my brothers REALLY think the quilt I made is AWESOME!! 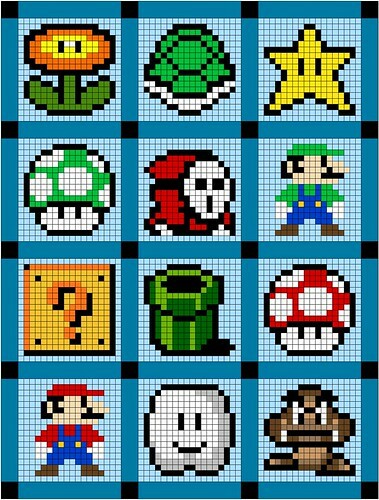 ps- as I mentioned to you before, that I am having my Super MARIOn Bros. quilt quilted with a Starwars design in glow in the dark thread. UBER geeked out quilt for my UBER-geeky-gamer-Starwars-fanatic husband! PPPS- Maybe I need to get some Princess Peach jammies for Christmas Eve? Ha ha, I did notice the Super Marion blog title and made the connection to Meltingmarions super Super Mario quilt on Flikr. I tried to download the last few blocks via Scribd and its saying I have to pay to get them. Are you charging for this pattern now?